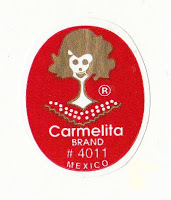 I had never gotten Carmelita brand bananas before, but what struck me about this sticker is the icon of whom I take to be product's mascot. At first, I thought that this was an image of a skeleton, and that there was some weird Day of the Dead thing going on with my fruit (they are from Mexico, after all). If you really look at it, there is something spooky and a tad disturbing about this label. "I see holes like eyes...."